For worksheet types that are based on a list of words (e.g. Wordsearch or Word Scramble) you can pre-populate text fields by using a word list. These word lists are derived from your previous worksheets and from worksheets shared by our members. Where this feature is available the button below will be displayed. 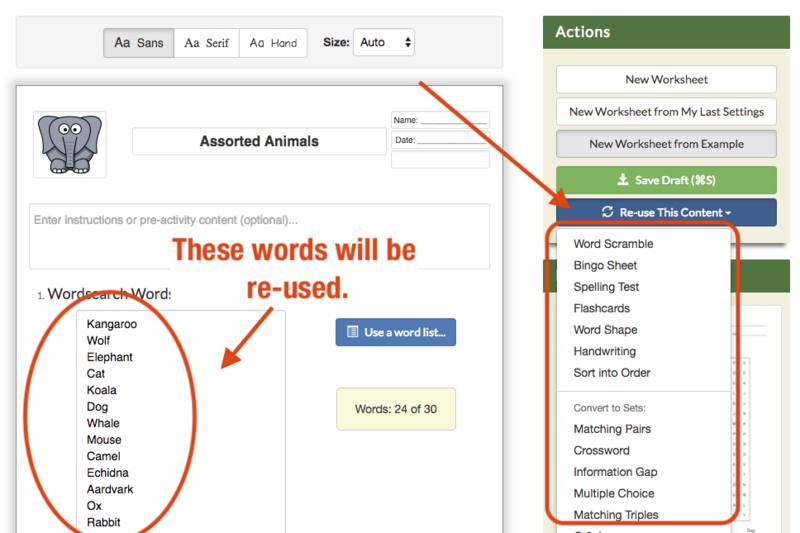 Clicking on "Use a word list..." will bring up a dialog that will allow you to select a word list. You can search the lists by entering a search term, which will narrow down the results. 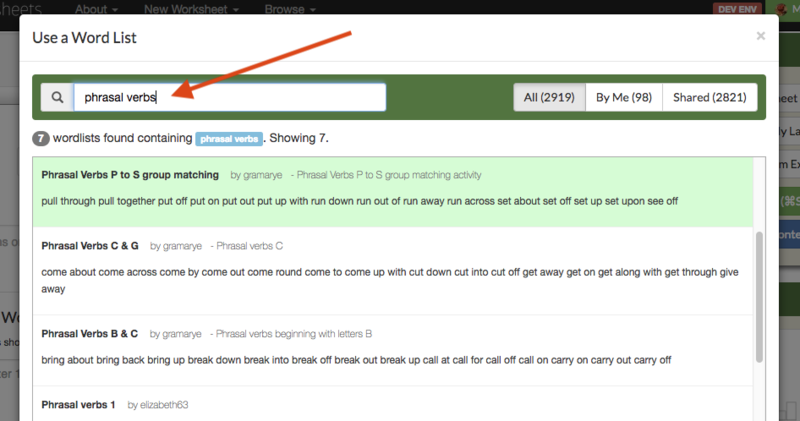 Click on a word list to pre-populate the text fields with its content. You can then make any amendments that you wish before finalising the worksheet. You can create worksheets by copying and pasting text from another source such as your school syllabus or a public domain article. For worksheets that only have a single input field for all content (such as the Wordsearch or Cryptogram) simply click on the input field and then paste the text by selecting "Paste" from your browser's edit menu. 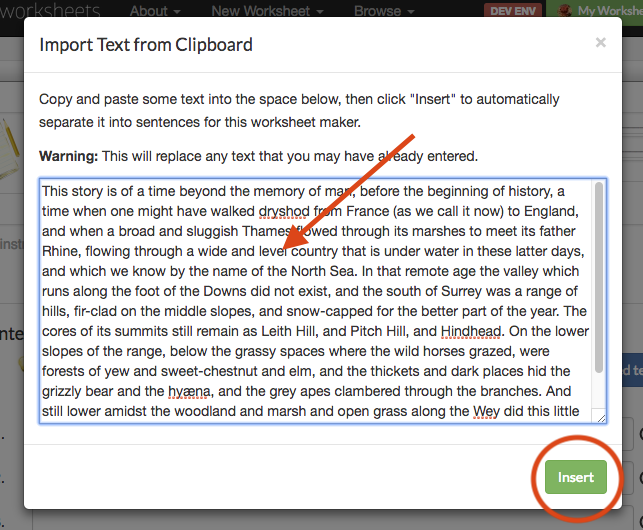 For worksheets accepting individual sentences you will notice a button labelled "Use pasted text...". Clicking on this button will bring up a dialog where you can paste a passage of text. Paste the text into this dialog and then click "Insert". Quickworksheets will automatically split the pasted passage into sentences and pre-fill one sentence for each text field as shown below. After you have made a worksheet it is easy to make another type of activity using the same content. After completing your worksheet, and without navigating away, click on the "Re-use This Content" button on the "Actions" panel and select the type of worksheet you want to make. After a few seconds the content from the worksheet you have just made will be transferred to the new worksheet generator that you have chosen. You can also use this feature by loading a previous worksheet from your My Worksheets page (or a Shared Worksheet from our library) and then clicking the "Re-use This Content" button to transfer the words or sentences to a different type of worksheet maker.